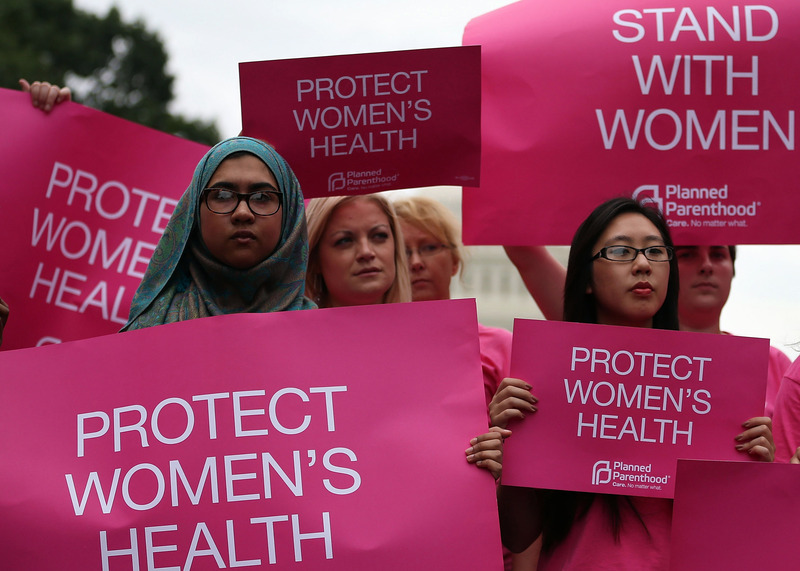 Curious how your state stacks up on reproductive rights? Wonder no more. The National Abortion Rights Action League or NARAL has compiled their 2014 reproductive rights report card for the 50 states, giving each one a letter grade. And because NARAL isn't grading on a curve, the results are pretty bleak. The United States as a whole gets a D.
Still, there are a few bright spots. If you live in California or Washington state, you can rest easy knowing your state received an A+, with California rated first in the nation. Ten other states also received an A or A-. However, the most common grade on the report card was an F. Fully 25 states — half the country!— flunked. And the state with the lowest ranking? North Dakota. Apparently 98% of North Dakota counties have no abortion provider, and the state's laws are strongly anti-choice. Of course access continues to be a problem everywhere. Even in top ranking California, 22 percent of counties don't have an abortion provider. It's worth noting as well that there isn't much of a spectrum on this issue. Though the most common grade on this year's report is an F, the second most common is some form of A. In between there is a smattering of B's and C's and one D+ (Rhode Island), but as a whole, the states seem to have gone to one extreme or the other. So even though we all know the country is highly polarized on this issue, it's interesting to see how geographically dependent it is. The report also notes how many government officials are pro-choice, and the numbers there aren't very encouraging, either. As for state legislatures, it depends on the state, though only seven states have both a pro-choice majority in the legislature and a pro-choice governor. So even though there is that wide gap between high grades and low ones, not all of those high grades are very secure. "If Roe v. Wade were overturned, it would open the door for anti-choice lawmakers in state and federal governments to enact and enforce laws banning abortion. In fact, some states already have abortion bans on the books, either from before Roe or because they enacted laws after Roe hoping to prompt the Supreme Court to overturn it. Currently, these bans are unenforceable; however, if Roe were overturned they would become enforceable immediately." So 2014 is not off to a great start if you're pro-choice. Will this be the year that the War on Women takes a turn for the better and the assault on reproductive rights ends? It doesn't seem very likely, but who knows? A year is a long time. Hopefully the 2015 report card will look better. And if you live in California or Washington, know that your right to choose is still safe.